We have a lively tradition of music and drama. Our theatre, The Barn, is used for plays, pantomimes, musical recitals and ad-hoc student productions, including the much-loved annual talent competition. At weekends, it becomes the Fyling Hall cinema showing the latest movies. School parties regularly attend productions at the Stephen Joseph Theatre in Scarborough where internationally celebrated playwright Alan Ayckbourn premieres all his new work. The theatre has an active outreach programme for young people and, from time to time, our pupils have opportunities to tour backstage, meet the cast and even to audition for parts in certain productions. Music making has always flourished at Fyling Hall. 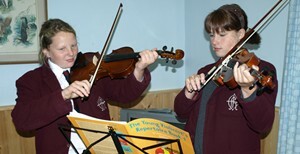 Many students choose to learn an instrument, which also enables them to play in a variety of chamber ensembles. Individual tuition is available for piano, guitar, strings, woodwind, brass and percussion. Singing lessons are also offered, and our choir and young instrumentalists regularly perform both within the school and around the local area.